This week has just flown by, and it definitely was one to remember. Not only did I finish up a lot of last minute wedding details, but I picked up my wedding dress (it's been being made for nearly six months! ), and finally got to see our custom made weddings bands. Eek so exciting! I am not going to lie, I'm currently a mix of nerves, excitement, jitters...you name it, I'm feeling it. Everyone has told me that it's over before you know it, so I am certainly soaking it all in. After so much planning, I'm not going to take this special time for granted. 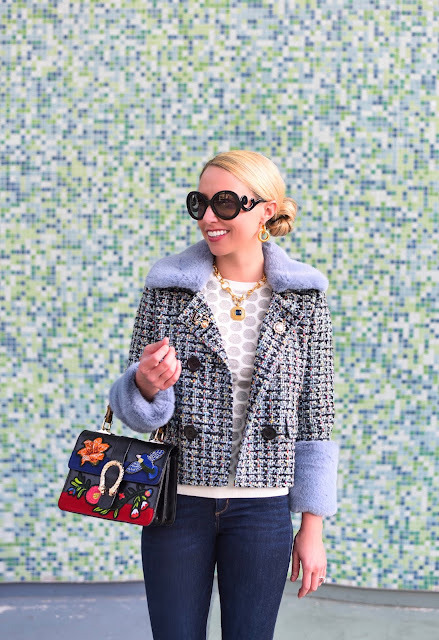 Speaking of special, how fun is this fur and tweed jacket? With the cooler weather we've been having, it's been the perfect go-to! However, last week when I actually shot this look, it was nearly 90 degrees and OTN boots, a sweater, and jacket were the last thing I wanted to wear! The quality of the faux fur is excellent, but I was a little disappointed by the fit of both the sweater and the jacket - definitely go up a size, as they run small. I always get asked so many questions on this purse. It's such a statement piece, and goes with everything. It can be dressed up or down, and I love that it only looks expensive. Can you believe the price tag is $30?! My jeans are also a steal, and are currently on sale for $40! They run TTS, but I typically size down because they have a lot of give (they're made with a mix of spandex material).